I love reading medieval self-help books (or “mirrors for princes” – as scholars call them) like Secreta Secratorum and The Consolation of Philosophy. Both are great, but the one I spend the most time with is Boethius’ The Consolation of Philosophy. My interest in Chaucer led me to Boethius since Consolation is one of Chaucer’s favorite touchstones. Once you read Boethius (or Boece, as he is called in Middle English texts) you’ll forever see flashes of his guiding philosophy in Chaucer’s poetry. In any case, Boethius quickly became a friend in my own spiritual journey. My wife Jessica and I even used a passage from The Consolation of Philosophy in our wedding ceremony. And no, it wasn’t a “medieval-themed” wedding THANK YOU VERY MUCH! Reading Boethius in modern English translation alone, however, does not satisfy the medievalist. We look to “the versions they used” and while we might not always find them, there are other versions that give us ideas of how Boethius was appreciated in the medieval world. Chaucer translated a version himself into English but he was not the first to do so. An Old English version is attributed to Alfred the Great, the 9th century Saxon king of England. How involved Alfred actually was in its composition will likely never be known, but we know that he placed great value on the text and at least commissioned its production. Reading Alfred the Great’s version, you’re instantly struck by its heroic language. The quick prologue Alfred provides smacks of the opening lines of Beowulf and Sir Gawain and Green Knight. 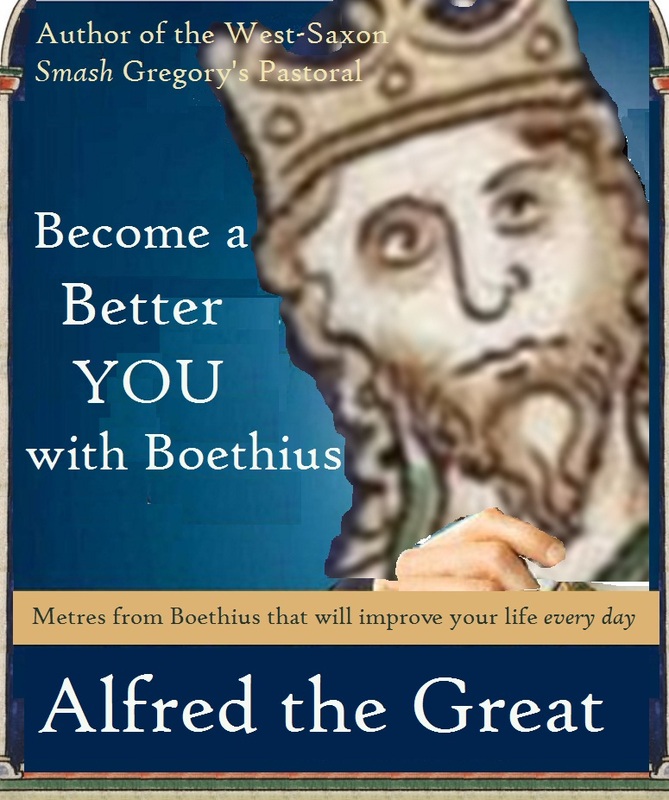 In Alfred’s version Boethius is a Christian man who fights for justice to save his people from the evil tyrant Theodoric. After the spirited prologue, however, the narrative becomes – more or less – the one we recognize from Consolation. Something interesting about the Saxon version of Boethius attributed to Alfred the Great, though, is that the character Lady Philosophy is called Wisdom (and sometimes Reason). Her character is also masculine rather than feminine, but aside from that we are not given any other physical characteristics. Boethius isn’t “visited” by Lady Philosophy in reality or dream vision in the Saxon version. It is as if the “Wisdom” and “Reason” dialogue with the “mind” occurs in the character’s head whereas in Consolation Lady Philosophy (also referred to as a physician) appears and “treats” Boethius. Also, the “muses” Lady Philosophy chases away are simply referred to as “worldly pursuits” in the Saxon version as opposed to a greater pursuit: striving to know – but not being arrogant enough to think one can “possess entirely” – wisdom. Consolation presents a philosophy that is somewhat universal, but the Saxon version manages to be even more universal in a way. It isn’t watered down to the extent of a message from Joel Olsteen, for example, but the concepts are presented in a disarming way that complements Christian thought and could help a medieval reader in much the same way a Joel Olsteen book would help someone today. Comparing Boethius to Joel Olsteen may seem inappropriate to some medievalists, but I’ll bet Boethius was more accessible than Aquinas (or even Dante) among contemporary medieval readers. The method is also surprisingly similar to modern psychoanalysis and behavior change through self-awareness. In addition to the text’s teaching and guiding philosophy that is meant to complement Christian thought, something makes the king who promoted the text seem revolutionary for his time. In Alfred’s version, the hero Boethius is a senator who feels his leader is not morally fit to govern his people so he seeks to remove him from power. A king who promotes this kind of hero is telling his subjects that rulers are to be held at the highest moral standard and are obligated to share wisdom and book-learning with their people. And if they don’t – any one of their subjects should remove them from positions of power. That sounds a lot more like democracy than feudalism! 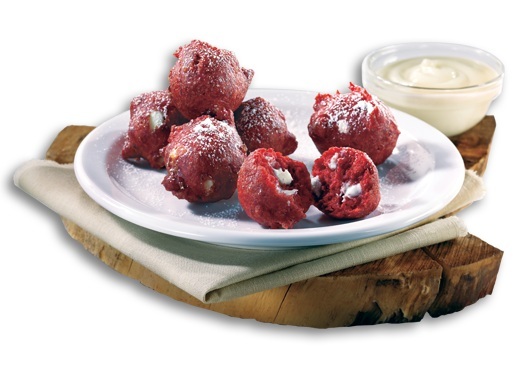 Every blockbuster needs some sort of a restaurant tie-in to tempt us to buy something heavily sugared and loaded with enough artificial ingredients to turn our insides neon green. It’s the American way. 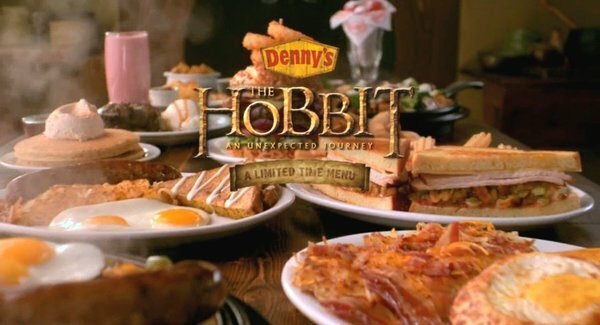 However you feel about Denny’s special Hobbit-inspired menu, I find it amusing to think that people might be saying, “Radagast” at Denny’s – and not just Radagast, but – Radagast’s Red Velvet Pancake Puppies®. Gylfi was a wise king who governed what we now call Sweden. After hearing many wondrous things about the Aesir and, wishing to learn more about them, he went out on a secret journey to find Asgard – the home of the Aesir. He even went disguised as an old man – just like Odin would do when he went wandering in the land of mortals. So, Gylfi arrived at this hall whose roof was shingled with golden shields just like Valhalla – Odin’s hall in Asgard. The first person he saw in this curious hall was a man juggling seven knives. Is this a dream vision? Fortunately for us, Gylfi asked these three kings many good questions like, “Who is the foremost or oldest of all the gods”, “What is there to relate about Ragnarök?”, and all sorts of follow-up questions about the many other things in between. “I hope I never smell the smell of apples again!” said Fili. 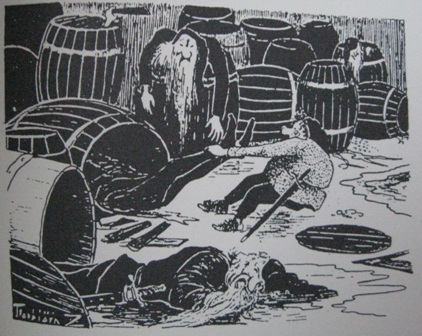 “My tub was full of it.” An illustration from a 1947 Swedish edition of The Hobbit. image: The Annotated Hobbit, ann. Douglas A Anderson (Houghton Mifflin/Boston, 1988). Snorri Sturluson, The Prose Edda, trans. Jean I. Young (Berkeley, 1954), 30,31.